Enjoy this home rental and its close proximity to Superior National Golf Course, mountain trails, biking, skiing and more. 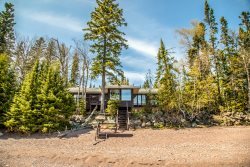 Baileys on the Lake is a gorgeous cliff`s edge home on Lake Superior Incredible views of Lake Superior from the home as well as the private beach and balcony. Baileys on the Lake as you approach it from the quiet, dead-end, gravel road. The cozy living room features comfortable furniture and a stone surround wood burning fireplace. Watch a movie on the flat screen TV or enjoy the 180 degree view from the floor to ceiling windows. The home features modern architecture with a classic North Shore feel. The open living space allows for guests to easily interact in all common areas This absolutely gorgeous kitchen is fully renovated and well appointed to take care of your cooking needs. Enjoy the stainless steel appliances and granite countertops. The master bedroom features a queen sized bed and a washer and dryer for extended stay use. The first guest bedroom features a queen bed. The second guest bedroom has two twin over twin bunk beds- excellent for kids The second set of bunk beds in the guest bedroom. The remodeled bathroom features a stone walk-in shower and granite countertops. Head outside and have a meal at the picnic table. Please note: the fire ring is no longer there, outdoor fires are not allowed. Surrounded by natural foliage and Lake Superior- you can`t beat that. The front deck is a great place to take in the surrounding beauty year round. Because you are perched on the edge of a cliff the views are incredible no matter which way you look. The lake jets out as far as the eye can see. Lake Superior has many moods and can go from clear and tranquil to high waves in minutes, so enjoy them all during your stay. Literally perched on the cliff's edge with Lake Superior striking the rocks just feet below, the ambiance and beauty of this cozy vacation home are unbeatable. Enter into the Great Room of this three bedroom vacation home here in Lutsen and be amazed by the majesty of the Great Lady. With commanding 180 degree views of Lake Superior, your stay is enhanced with a massive natural stone fireplace combined with a walk-out deck having the big lake serve as your companion. Baileys on the Lake is a peaceful getaway from the big city. Located down a quiet dead-end gravel road, you can't even see a neighbor from this property. Take a stroll down to the large, private ledge rock beach area that butts up against a gentle river to really enjoy the surrounding beauty. Surrounded by trees and foliage, you feel like you're camping in the Great Outdoors while in the comfort of a modern, cozy home. The fully renovated, well-appointed kitchen features granite countertops and stainless steel appliances so you can prepare meals during your stay. Prefer to eat out? You are just a short drive away from many of our wonderful North Shore restaurants, including many hidden treasures. You are also centrally located to many of the area's attractions, including just minutes away from Lutsen Mountains Ski and Recreation Area and the Superior National at Lutsen Golf Course. After a long day of adventure you will love coming home to relax in front of the fireplace. Note: For safety reasons, outdoor fires are not allowed. When I have called with a problem ,they got it taken care of right away. Its a wonderful place to experience the north shore. We have stayed there a least a dozen times and love it. We have noticed improvements that have been made to make it more comfortable . My only complaint is with the price going up , we can only go once a year and we shortened our stay. Very good service. Correct information. Pleasant. Our family had a wonderful vacation. We enjoy Baileys very much. The house is beautiful with exceptional views of the lake and it is well equipped. Extremely easy to work with! We have rented through Cascade for many years and continue to rave about it to our friends. We have stayed at many of the locations and have never been disappointed. A beautiful location.......loved being perched on top of the bluff overlooking the lake. The lake is enjoyable during every kind of weather! Always helpful... kind and great to work with. Phone & email communication was top notch. Very clear about the rules. We had to use the emergency number die to a alarm going off for the septic system. The response to this emergency call was prompt and dealt with immediately. I also stopped into the office to locate the trash drop off location. The office staff at the front desk was very friendly and helpful. It was great working with a front desk person who was so friendly. Great service! Beautiful cabin, incredible view, fairly priced, convenient to Lutsen Mtn, excellent management company website and communication between them and myself. Very excellent service, friendly and helpful. We very much enjoy the house, location, and cleanliness. The views are exceptional, and the location allows for many recreational opportunities. If I could give more then 5 stars I would. Everything was perfect! The house was beautiful, view was awesome and it was beyond clean. Everything you could need was provided in the kitchen and bath. We just loved our stay and look forward to coming back. This is the second year we have stayed at Bailey's on the Lake and it did not disappoint in any way. We love the space in the house and spent a lot of time on the deck reading and listening to the waves flop. View was great. House was awsome. Will go back again. This was first visit for my wife and kids to north shore and they want to go back. We love Bailey's on the Lake! It is beautifully situated, private, comfortable, and stylish without being too grand. We have stayed here several times and plan to again. We have also recommended Bailey's to others and I know that has resulted in rentals there. We loved being right on the lake and near the Sugarbush cross country ski area.